One of NASA’s most recent news stories features work performed at Goddard Space Flight Center, where researchers are trying to develop mathematical models that will help us understand the results from New Horizons, a spacecraft on its way to Pluto (arriving in July of 2015). While Pluto may have been demoted from “planet” to “dwarf planet,” it can still teach us many things about the history of our Solar System. What might New Horizons see when it reaches Pluto and its moon, Charon? What will those observations tell us about the histories of these two planetary bodies? Like all good scientists, this team of researchers at NASA are developing detailed hypotheses about the places the spacecraft will visit. First: will Charon be fractured? Many icy moons are crisscrossed by patterns of huge cracks, or faults like California’s San Andreas. For example, Jupiter’s moon Europa has so many long, dark linea (linear features) that there’s an entire wikipedia article dedicated to a list of them! Many researchers believe that these giant fractures are the product of gravitational tides, which repeatedly bend and eventually fracture the ice shell. At Saturn’s moon Enceladus it is thought that tides continue to open and close the moon’s “Tiger Stripes,” causing jets of water vapor to spew out of the moon’s south pole at regular intervals – a space version of Yellowstone’s Old Faithful. It’s possible that Pluto’s moon, Charon, experienced tides like this soon after its formation, perhaps leading to fractures across its icy surface. By building a mathematical model of Charon and Pluto which examines the strength of their gravitational interaction, these researchers have described the conditions under which Charon’s surface would have fractured, and if New Horizons sees linea on Charon, this research may explain how they formed. 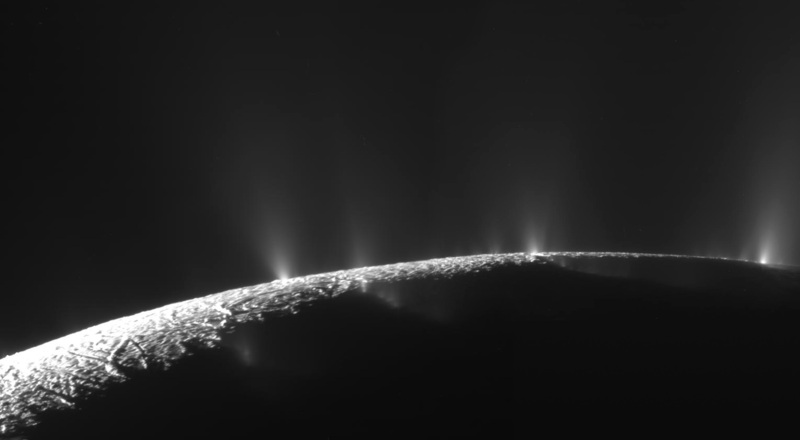 Plumes erupt from huge fractures in the surface of Enceladus, a moon of Saturn. Image courtesy NASA. But the picture gets even more detailed: the location and orientation of these fractures depends on the thickness and viscosity of the ice enveloping Charon. The viscosity (how easily the ice flows when pushed by, for example, gravity) depends on many things – temperature, pressure, the purity of the ice, and even the size of each individual ice crystal – so it is a major “unknown” in models of icy moons. These scientists, however, recognized that because fractures are driven by stresses, which are in turn affected by the deep structure of the moon, the patterns of fractures we (might) see on the surface tells us about what is happening deep below the surface. To explore this idea, they envisioned many different potential thicknesses and viscosities of Charon’s ice layer and subjected these hypothetical ice shells to tides using computer models, then observed the resulting fractures (or lack thereof). Their results are, in a sense, a picture book of fractures on Charon, each with their own back story, which scientists can consult once they have images from New Horizons – see the fractures, find the matching model, and voila: a theory on the orbital history of Pluto and Charon! The photos from New Horizons will be a great test of these scientists’ hypotheses. So when New Horizons reaches the end of its long journey, keep an eye out for photos. Grab this paper off of Google Scholar and see if you can figure out how thick the ice shell is! Read the original article here, on NASA’s website. Rhoden, A. R., Henning, W., Hurford, T. A., & Hamilton, D. P. (2014). The interior and orbital evolution of Charon as preserved in its geologic record.Icarus.